These light, wheat- and gluten-free cakes can be made in advance, wrapped and frozen. Don’t decorate them more than a day before you want them. 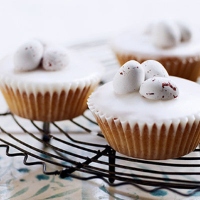 Preheat the oven to 180°C/gas 4 and place paper cases in two 12-hole cup-cake tins. Sieve the flours and baking powder into a mixing bowl; stir in the ground almonds. Add the butter, lemon zest, caster sugar and eggs and whisk together until smooth. Place a heaped tablespoon of mixture into each paper case. Bake in the middle of the oven for 10–15 minutes or until they are light golden. Transfer to a wire rack to cool. Meanwhile, for the icing, sift the icing sugar into a bowl and mix in the lemon juice to form a paste that thickly coats the back of a spoon. If it is too thick, add more lemon juice. If it is too thin, beat in a spoonful of icing sugar. Spoon over each cake; top with mini eggs or sugar flowers. Leave to set. A classic tea is best with these cakes.